Release Date: August 17th, 2007 (Lincoln Plaza Cinemas) by New Yorker Films. The Cast: Joan Chen, Sun Haiying, Liu Zifeng, Zhang Fan, Gao Ge, Wang Haidi, Liang Jing. BASIC PREMISE: Xiangyang rebels against his artistic father, Gengnian (Haiying), from age nine through thirty while discovering himself in the process. 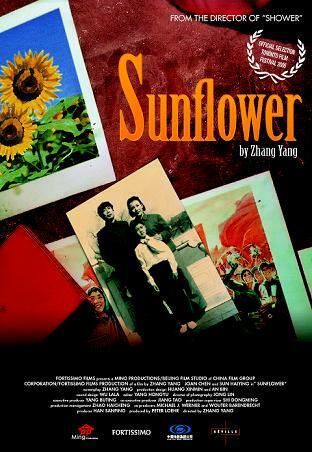 ENTERTAINMENT VALUE: From the director of Shower and Quitting comes this very absorbing and compelling drama that spans many years in the life of its protagonist, Xiangyang, whose name derives from sunflowers his family grow. For the first nine years of his life, he spends time with his mother (Chen) while his father, Gengnian, gets sent to labor camp. When his father returns from the camp, Xiangyang (Fan) suddenly gets disciplined and molded by him to develop the skills of painting. It turns out that Gengnian had his hands crushed during the labor camp, so he can’t paint. He simply wants his son to follow in his footsteps and to learn how to develop a passion for something. At the age of nineteen, Xiangyang (now played by Gao Ge) has his mind on other passions, namely a young woman he sees at an ice skating rink while drawing her. Eventually, they start dating despite the disapproval of his father and mother who don’t like the fact that he’s cutting school. He’s forced to separate from his girlfriend while she goes away to a far away school. In the final segment, Xiangyang (Haidi), now thirty-years-old, reunites with his girlfriend while the tension between father and son becomes more intense. Each of the three actors who play Xiangyang give a convincing performance, but the real stand-out here is Sun Haiying as his strict yet likable father. Co-writer/director Zhang Yang wisely allows the plot to flow at a natural pace and includes plenty of character development. Every scene feels real and believable. From start to finish, it’s easy for you to become absorbed by the events and immersed in the lives of a father and son who, despite their stubbornness and fights, are learning more about one another each and every day. IN A NUTSHELL: A deeply moving, compelling and heartbreaking saga.